It’s been a while since I’ve posted anything here (I’ve been very busy with my work for SwitchDin, who are up to lots of cool, forward-looking stuff – more on that in another article), but I’ve just been so happy with how it’s going that I felt inspired to write about it here. No one is paying me – I’m just a freewheeling rooftop solar evangelist, spending my spare evenings doing this instead of catching up on sleep. So the biggest thing that’s changed in my house since the last time I wrote – and perhaps the most topical in light of the recent heatwave and its impact on our energy system – is that we replaced our old, dinosaur-like air conditioning unit with a newer, smaller one. The previous one made the windows shake whenever it was on and drew a steady ~7.5 kilowatts (kW) while in operation, regardless of what we adjusted the temperature to. By contrast, the new AC unit is more flexible (and the zones actually work), so we can cool single rooms on low and draw less than 3kW depending on how furiously we run it – which isn’t much compared to some homes we know of where 24/7 climate control is the norm. Plus, we’re more of a winter heating home than a summer cooling one. It was therefore extremely satisfying to see the image below on one of the hot days at the end of last year. We were at home taking refuge from the heat in the middle of the day, and in noticed that we were drawing virtually no power from the grid. Can you spot when we were running the new AC during the day? 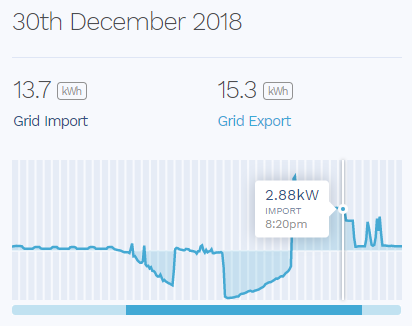 Solar completely covered the energy it required. The same didn’t go for the afternoon, however; since we don’t have a battery, we were drawing pretty steadily from the grid after the sun went down. The cost for the whole day was still only about $1.70 (excluding hot water). Meanwhile, Solar Analytics has sent me a barrage of notifications telling me what a good job my house has been doing using solar energy since summer rolled around. Notifications from Solar Analytics showing my home’s slow ascent from being one of the worst ranked solar homes in my vicinity to being…one of the moderate ones. Our previous poor performance was due in large part to the fact that we heated the house with our monster air conditioner every morning during the winter before the sun came up. 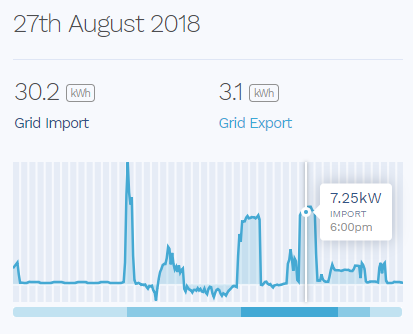 It’s a bummer that we’ve still got to rely on the grid for our afternoon electricity, and it bothers me that we’re part of the collective force behind the emergence of the duck curve in wholesale energy market prices. Having a battery would help with this to a degree, but we haven’t got one on the cards for a few years now that we’ve just spent a wad of cash on the (much needed) new AC unit, which was the higher priority investment anyhow. But for the time being we’re still managing to meet a good chunk of our energy needs locally with clean energy from our roof. What’s more, our energy costs for the month of January looks like it’s going to be right around $30 (excluding hot water) – and our next quarterly bill will probably be well under $300 (again). And that’s without even really trying to modify our energy consumption habits much! So – are you sold on solar yet?